Googling something somewhat unrelated, I stumbled upon French Accent, “the magazine of Learn French at Home”. This is a downloadable magazine (PDF and MP3 audio files) published bimonthly, its slogan claims to be a “unique interactive e-magazine for French learners”. I must say, I was rather pleased with its contents, although its website is in need of a serious facelift. Devoted to expats living in France, Francophiles and French learners of every level, this magazine proffers a tidy range of topics about French travel and culture, vocabulary and grammar lessons, dictation exercises and games. French Accent, does have a price tag: $7 per issue or $34 per year. Nevertheless, quite a bit is available for free sprinkled throughout each issue. But, in case you’re interested, I found some complete back issues either in PDF or digital pub formats totally free. I like complete and totally free! And I appreciate the French Accent folks making solid study material such as this available to us, French learners. So that’s about all I could find for complete back issues of French Accent magazine. I hope they help you and your children to better your French. This will definitely be valuable in our homeschool! 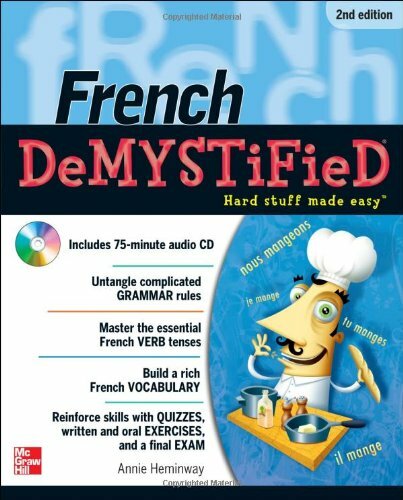 Speaking of free French learning materials, while I was at issuu.com reading a bit of the FAM’s back digital pubs, I happened to also find the complete digital pub for French DeMYSTiFieD by Annie Heminway, though the audio was nowhere around. Despite the mixed Amazon reviews (I think the not-so-good reviews are about the Kindle edition mostly), with a price tag of $0, it’s totally worth taking a look –I’d say. I intend to do just that, I’ll let you know how it goes.